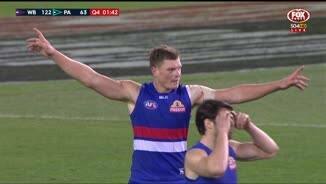 This is the first time Western Bulldogs have won consecutive matches by 10 goals or more since Rounds 2 and 3 2011 against Brisbane and Gold Coast. This is Port Adelaide's biggest loss since Round 22 2013 against Fremantle. 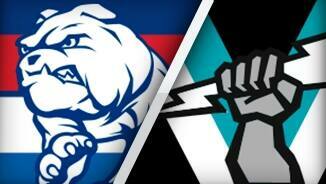 Western Bulldogs have comprehensively beaten Port Adelaide by 64 points. The Bulldogs dominated the Power across the three major facets of the game; winning the ball, using the ball and applying pressure on the opposition. 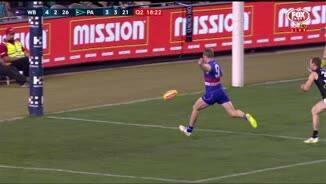 Western Bulldogs have kicked 5.1 (31) from within 15 metres of goal, directly in front. Port Adelaide has only kicked 1.0 (6) from this distance. 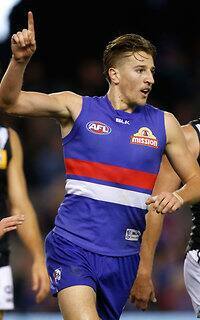 Western Bulldogs have won 31 clearances and have created 15 scoring attempts directly from them. Their 10.5 (65) from stoppages is the highest score they have kicked from this source this season. Port Adelaide has kicked 6.4 (40) from 32 clearances. In the final term Jack Redpath has taken five marks, with four inside 50 and two contested. He has kicked four goals from five kicks this quarter. His previous personal best of goals in a game is three across his tengame career. 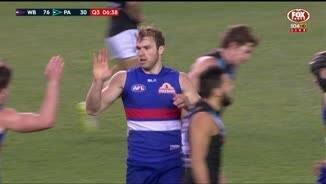 Western Bulldogs have ten players with 20 disposals or more but Port Adelaide have none. Jackson Macrae leads all comers with 30 disposals. Western Bulldogs have stuck to their brand of winning the hard ball today, doubling Port Adelaide's figures (48 to 24). This season the Bulldogs average 7.2 more hard ball gets than their opponents (ranked first in the league). Even though the Western Bulldogs have had 132 more disposals than Port Adelaide, they have also applied three more smothers than the Power (eight to five). Western Bulldogs have created 23 forward half intercepts, right on their season average of 22.6 per game (ranked 5th). The Bulldogs have gone on to kick 4.5 (29) from these possession gains. 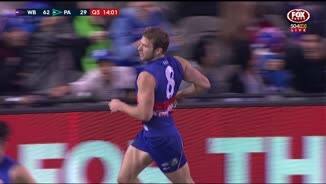 Western Bulldogs InterchangeBailey Dale was substituted into the game for Tory Dickson. Disaster for Port Adelaide from the kick in, with first Pittard stepping over the goal square giving away a ball up. Then Ryder gave away a free kick for deliberately rushing a behind from a hit out. 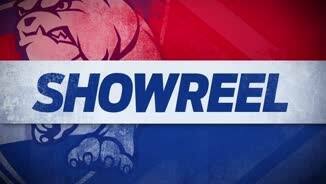 The Bulldogs have kicked 5.0 (30) from free kicks. Western Bulldogs have goaled from the first centre clearance of the final term. The Bulldogs have won 12 centre clearances to seven by the Power. Chad Wingard has kicked his second goal from limited opportunities. 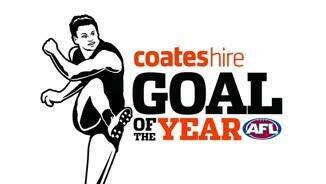 He has now kicked 30 goals since Round 10, nine goals more than any other player in the league. Western Bulldogs' pressure has been a feature of its play today. The Bulldogs have recorded a tackling efficiency of 81 per cent, well up on its season average of 70 per cent. Meanwhile Port Adelaide has tackled at just 61 per cent efficiency today. Bulldogs InterchangeJake Stringer off due to an injury. Power InterchangeJarman Impey off due to an injury. Power InterchangeBrad Ebert off due to an injury. Power InterchangeAaron Young off due to an injury. Welcome to Etihad Stadium for the Western Bulldogs v Port Adelaide Round 19 clash. THIS was meant to be the game that saw football played how we like it, a match containing two teams who attack and attack in spite of the congestion problem plaguing the competition. 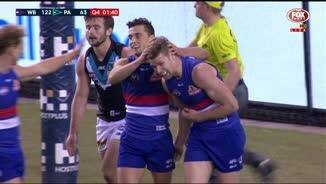 But for the neutrals who might have come along expecting to see an engaging contest between the Western Bulldogs and Port Adelaide, the Dogs had other ideas. 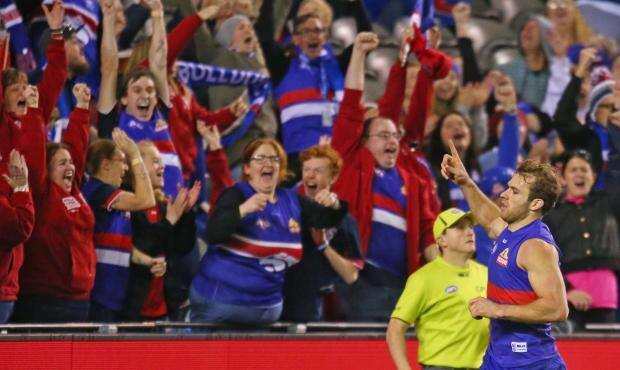 Luke Beveridge's side spotted another important win, and went big. It was engaging, but for purely red, white and blue reasons. The Dogs' ascent up the ladder continued on Saturday with their 64-point win over the Power at Etihad Stadium, which saw them move into fourth position on the ladder. If results go their way, they might stay there by the end of round 19. It also all but ended Port's slim finals hopes. Few (if any) would have predicted either of those things in March. But judging by the Dogs' rampant form against the Power in the 19.14 (128) to 9.10 (64) victory, there might be more mountains climbed yet. They were at their clinical but instinctive best under the Docklands roof, showing dare and dash but combining it with strength at the clearances and muscle around the ground. Contributors were on every line. Mitch Wallis (28 disposals) dominated throughout, Lachie Hunter's growth as a midfielder continued with 31 disposals, stand-in skipper Matthew Boyd (32 touches) gave good drive off half-back and fellow defender Shane Biggs was smart with his 27 disposals. 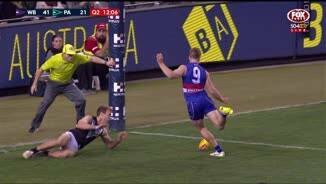 Again their slightly unusual forward set up was too hot to handle, with Jake Stringer and Jack Redpath booting four goals each and Stewart Crameri and Tory Dickson kicking three. The Stringer show has built a big following this year, and again had its twists, turns and trademark snaps. He keeps crowds entertained, lights up afternoons and leaves fans wanting more. You get the sense he will like the finals stage. There isn't a forward like the third-year Western Bulldog in the competition, and his bag against the Power took his season tally to 40. He left the field several times with injury scares but still managed to see out the game. Alongside him Dickson chipped in, proving his abilities as a smart and efficient medium forward. Crameri did his bit in a busy display, Redpath booted all his goals in the last quarter, while smalls Caleb Daniel and Luke Dahlhaus were hard to contain at ground level. 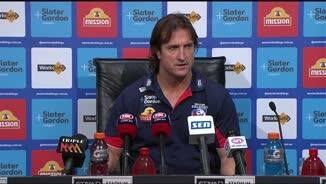 "It was a really strong performance – it was a shaky start though," Beveridge said. "To the boys' credit again, we've had a few of those starts in recent times, they settled really quickly and arrested the momentum back. In the end it was quite an outstanding performance across the board." The mystery of Port Adelaide in 2015 got deeper, with the pre-season premiership favourites slumping to their 10th defeat of the season which left them at least two wins outside the top-eight. 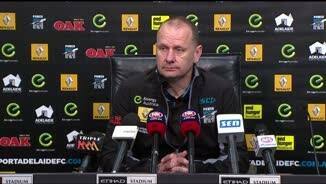 Port coach Ken Hinkley said it was the most disappointing loss in his three-year stint in charge of the Power. "They're a team who are excited by how they're going, and they know what's probably on the horizon a little bit. 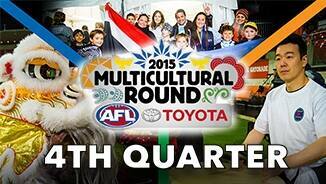 And we're a team that was just trying to hang on to our footy season," Hinkley said post-game. "When you play like you're just trying to hang on, eventually you're going to crumble and we crumbled today." Their stop-and-start form across the year was evident again facing the Bulldogs, after a quick and lively opening amounted to little. Wingard was active early, taking the first mark of the game, setting up the first goal and having the biggest say of the first quarter. Of the Power's three opening-term majors, the star forward kicked one and delivered brilliant passes to the other two goalkickers who converted their shots. The Bulldogs took a little time to settle to Port's quick start, and were without the cool and uncluttered mind of captain Robert Murphy off half-back. But 50-gamer Jack Macrae kept things in control in the midfield with 12 first-quarter disposals, and by the first change they had chopped the deficit from 19 points to seven. 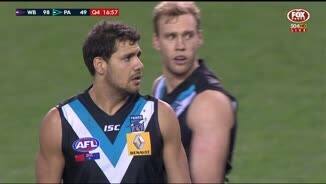 Port barely gave another yelp as the Dogs piled on the goals thereafter. They kicked seven goals to none in the second term to hold a 38-point lead at half-time, which was a gap that was never threatened. And just like last week's huge win over Essendon, the Bulldogs sniffed a percentage-boosting win and took it. The end margin not only demonstrated the huge gap between the teams on the day, but also for the year: one as the season's biggest disappointment, the other its brightest spot.